Villa Russo is a beautiful villa, which has been decorated and furnished to a very high standard. 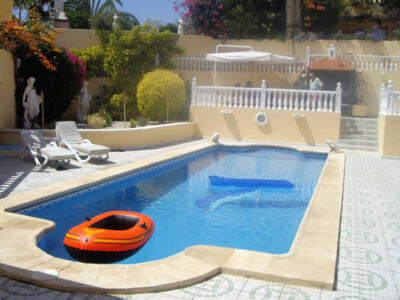 It is made up as a three bedroom villa which sleeps 6 and a two bedroom apartment which sleeps 4. So guests can either book the three bedroom villa or the villa and apartment together which would sleep up to 10 people in total. The apartment is not let out separately, so guests privacy is guaranteed. Outside there is a very large heated pool with roman steps and underwater lighting. There are ample sun loungers and patio furniture as well as a large barbeque. There are four double bedrooms and one twin room. The master bedroom has an ensuite bathroom, which includes a jacuzzi bath. The lounge is comfortably furnished and includes Sky TV and a DVD player. The villa is air conditioned and has an automatic sun blind system. separate fully fitted apartment with two bedrooms (one double and and one twin room); lounge with 2-seater sofa, TV and DVD player; fully fitted kitchen with washing machine; and a bathroom.